Many of those fleeing the destruction take an arduous route out of Syria, traveling hundreds of miles on foot across Turkey to the Aegean Sea. From the Turkish coast, the refugees board overcrowded boats for a risky water-crossing to reach Greek islands Chios and Lesbos, and then it’s on to the Greek mainland and into Europe. Along the way, teams of nongovernmental organization (NGO) aid workers triage the incoming refugees, spotting the sick from among the weary and offering what help they can. Amidst the flow of refugees, volunteers, global media, and border patrols during a peak in the exodus last November 2015 stood Catherine May, M.D., associate clinical professor of psychiatry and behavioral sciences at the GW School of Medicine and Health Sciences (SMHS), assessing the mental health landscape on behalf of medical NGO Remote Area Medical (RAM). It was an emergency mission made possible by Allen Dyer, M.D., Ph.D., professor of psychiatry and behavioral sciences at SMHS, who leads the department’s Global Mental Health residency track program. RAM was organizing a medical response mission to Greece, which is serving as a primary stop-over location for Syrian refugees. The group turned to Dyer for a recommendation based on previous associations as well as his reputation as a global mental health expert. He assembled a team led by May that included GW resident alumni Nicole Nguyen Perras, M.D., RESD ’16, and Sandeep Denduluri, M.D., RESD ’14. May’s mission was organized in fairly short order, in part because the department’s second-year residents were already engaged in a simulation exercise where they were preparing to respond to a yet-to-occur global disaster. 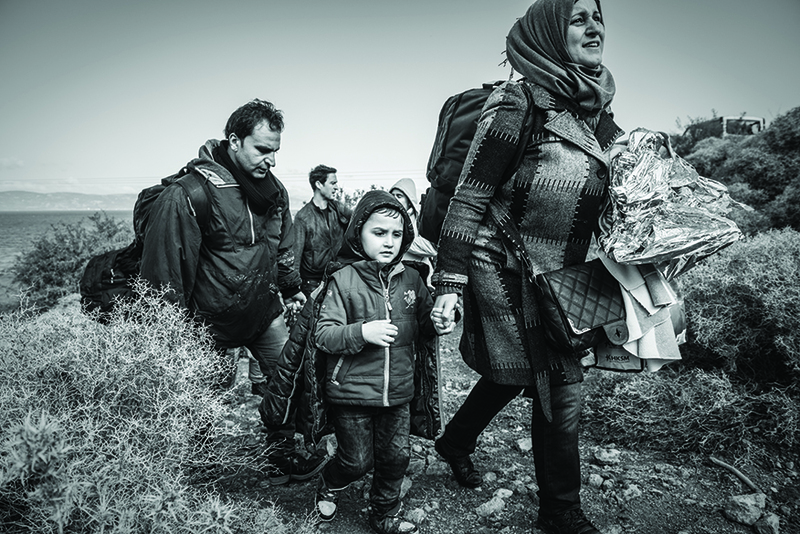 At the height of the refugee influx, Greece was receiving as many as 6,000 refugees a day. The refugees were in “migration” mode, eager to reach northern Europe, focused on physical, not emotional, needs. The United States Embassy in Athens, in conjunction with Greek NGO METAdrasi, again turned to Dyer and May to lead a program, “Building Resilience in Humanitarian Workers,” which took place in Athens in June 2016. The program also provided an opportunity for Fatima Noorani, M.D., RESD ’16, who participated in the workshop while still a resident. The department has been involved with Global Mental Health for nearly two decades. Five years ago, James Griffith, M.D., chair of the Department of Psychiatry and Behavioral Sciences and Leon M. Yochelson Professor of Psychiatry at SMHS, parlayed the department’s clinical expertise into the nationally recognized Global Mental Health (GMH) residency training program. While all of GW’s psychiatry residents participate in GMH training, and second-year residents participate in a variety of seminar series, typically a quarter of GW’s 24 residents seek more specialized training in global mental health. As the head of the GMH program, Dyer prepares psychiatry residents to respond to global health crises. Residents in the GMH track can spend a portion of each year engaged in international training experiences, at home or abroad through the department’s network of collaborations with the Carter Center in Atlanta, NIMH-funded research programs, DIGNITY (Danish non-governmental organization that provides torture recovery programs in low- and middle-income countries), and other organizations. Fourth-year residents can spend as much as eight months of their final year of training on international missions. During the past two years, GMH track residents participated in projects in Bangalore, India; West Bank, Palestine; Nigeria; Cambodia; Natal, South Africa; and Greece. In the early years of the program, residents bore their costs of travel for international projects, while GW maintained continued salary support. Fortunately, the Charles and Sonia Akman Professorship in Global Psychiatry, established in 2012, now offsets the travel expenses for many of those international projects. Together with travel funds from the Department of Psychiatry and Behavioral Sciences and the SMHS Office of International Medicine Programs, personal expenses for residents on international rotations have been substantially reduced. Around the world, mental health is the number one priority in terms of Disease Adjusted Life Years, the measure of the impact of health problems. Whether health care professionals are working in a post-conflict setting, in low-income countries with limited resources, or with refugees and torture survivors in the United States, mental health is a crucial aspect of care. “These are all different populations of people, but they share in common abusive circumstances or settings where there are very few resources for mental health,” says Griffith. To that end, the department’s GMH track has become an important feature of the school’s residency program. “This is a big drawing card, and one of the reasons that residents come across the country to train here rather than somewhere else,” he says. In recognition of its innovative curriculum, the American College of Psychiatrists awarded the global mental health program the 2016 Award for Creativity in Psychiatric Education. The program was a good fit for the multi-ethnic Washington, D.C. area, which, according to Griffith, is estimated to have more than 40,000 political torture-survivors in addition to other refugees from more than 50 countries. Residents in the GMH track rotate at the Northern Virginia Family Service, which provides community mental health services to immigrant and refugee populations. It’s “a perfect example of the global mental health work that we do locally,” says Eindra Khin Khin, M.D., RESD ’08, B.S. ’01, assistant professor of psychiatry and behavioral sciences at SMHS. Khin Khin leads the department’s Human Rights Clinic, which works in close collaboration with Physicians for Human Rights to assess asylum seekers. Most individuals have suffered political oppression and have been tortured by their governments or “under color of the law” in their home countries. Their asylum petitions are based upon the threat of harm were they to return to their home countries. Others seek asylum protection as victims of human trafficking or other crimes under the Victims of Trafficking and Violence Protection Act. “In this day and age of globalization, you really don’t have to leave wherever you are to do global mental health projects,” says Khin Khin, who has worked with many immigrant and refugee populations, and supervises pro bono psychiatric evaluations for people seeking asylum status in the United States. She isn’t alone in her commitment to global mental health. For Michael D. Morse, M.D., RESD ’16, clinical instructor of psychiatry and behavioral sciences at SMHS, practicing medicine — specifically the diagnosis and treatment of patients with mental disorders — was always part of his plan. It wasn’t until he journeyed to Jerusalem between college and medical school, however, that he witnessed how his passion for psychiatry and global health could have a real impact on physicians and patients in the Middle East. “With courage, humility, and dogged persistence, Michael has opened doors in the West Bank and Gaza, and showed how building mental health services can further the cause of peace,” says Griffith. In 2008, Morse, while still a student at the Harvard Medical School, created the Palestinian Medical Education Initiative (PMED), an international NGO based in the West Bank and in the United States. By 2015, the group earned international recognition, receiving funding from the German Regional Fund for the Middle East and North Africa to integrate mental health services into primary care settings in Gaza and the West Bank, and for parenting classes and other mental health initiatives in Ramallah.